After visiting the Crosswinds in Tagaytay where we had experienced a lush of nature, pine trees, Swiss inspired architecture and Christmas houses; we visited next the Picnic Grove. 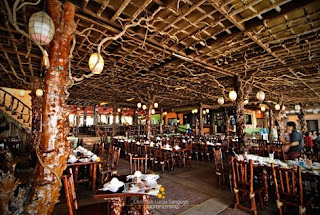 It is one of the most popular Tagaytay tourist attractions where there are so much activities to enjoy such as horseback riding, picnicking, riding a zipline and buying pasalubong. The scenario in Picnic Grove, Tagaytay is similar to what you will see in either Mines View Park or Wright Park in Baguio City—several stalls and chains of different food stalls, souvenir items and the like are all scattered in the place. You can also have your henna tattoo inside. The great part in Picnic Grove is actually the view of the Taal Lake and small Taal Volcano from afar. The overlooking view is stunning and wonderful. Actually, you can already see the Taal Lake view and the Taal Volcano from Aguinaldo highway since it is located in a ridge. If you don’t mind visiting Picnic Grove for the view, you can just park and find a spot where you can have a good picture of the lake and the volcano. However, if you want to go to a popular place to get a piece of memory with a backdrop of the beautiful lake and volcano, then Picnic Grove is a good choice. Obviously, there are some other places where you can have a good picture of the lake. An example would be is Tagaytay Highlands. But Picnic Grove is a staple once you say the word Tagaytay as to what Burnham Park is with Baguio City. I keep comparing these two cities because Tagaytay is reminiscent of Baguio City to me. We did not stay long in Picnic Grove because it was weekend when went there, thus, so many tourists are in there during that time. Siksikan. So after a few minutes of taking pictures and resting on their benches, we left the Picnic Grove for Leslie’s Bulalo. 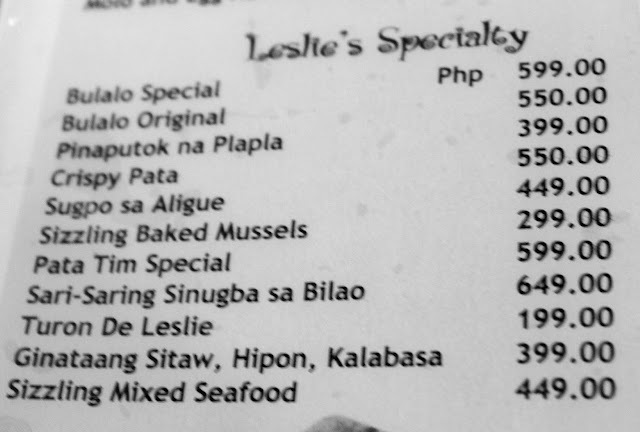 Leslie’s restaurant in Tagaytay is along Aguinaldo Highway. It is the main street in Tagaytay City. We were supposed to visit People’s Park in the Sky next, however, we were not able to do so because it was already getting dark that time. And we were already hungry. Leslie’s restaurant is has a nice woody ambient inside. In some occasions, there are local “harana” singers who will serenade you while eat. We seated inside the restaurant because the seats with an overlooking view outside were all already occupied. The best buko pie in the country! We ordered the famous bulalo, sizzling seafood, buko shakes and other stuffs. I love there bulalo! I see how bulalo is celebrated in this region (Tagalog region), and no wonder, they make the best bulalo in the country. The hot bulalo is just complimentary to the cool breeze in Tagaytay City. 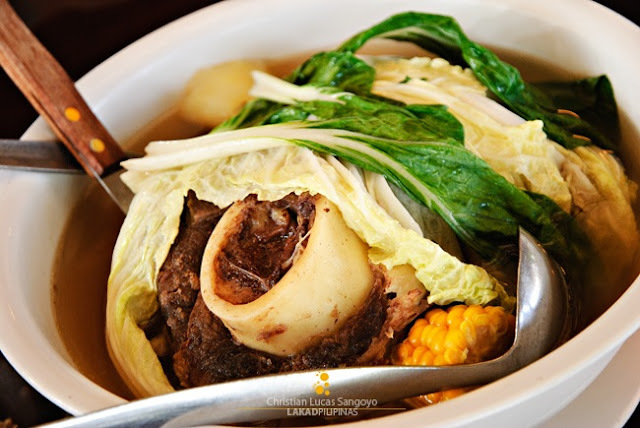 Bulalo is a beef soup based dish with compliments of cabbage (pechay) corn and sometimes potato. The mixture of this plus the slowly cooked beef is a burst of flavors you must experience when you are in Tagaytay City. There are other restaurants in Tagaytay that also serve bulalo and some of the best dishes in Tagaytay, so if you have time, then why not try them after you savor the flavors of Leslie’s bulalo. After we enjoyed our dinner in Leslie’s, we went to the nearby Starbucks Coffee shop which has a good view of Taal Lake also. However, it was already night time so we just reserved our seats inside (we can’t already see the view). Besides, the cool weather makes us feel to enjoy the warmth of the setup inside this coffee shop. I’m not promoting Starbucks as there are also other good coffee shops like Bag of Beans, although we admit, it is the experience of sipping coffee in a cool night weather in the vicinity of the well loved Tagaytay. After our coffee time in Tagaytay, we already opted to go home. Although we would want to have a taste of what Sky Ranch offers, it was an unplanned visit, so we actually did not have enough budget to enjoy the pay-as-you-ride scheme inside Sky Ranch theme park (it would have been better if it is an all night pass like the ones in Enchanted Kingdom or Star City, I just don’t know now if they already have it). Tagaytay City still has the charms you are looking for. If you are from Manila, Tagaytay City is a good choice for a quick relaxation mode. After more than an hour, we were able to reach Manila and another two hours made us arrive in San Jose del Monte, Bulacan where I used to stay before. 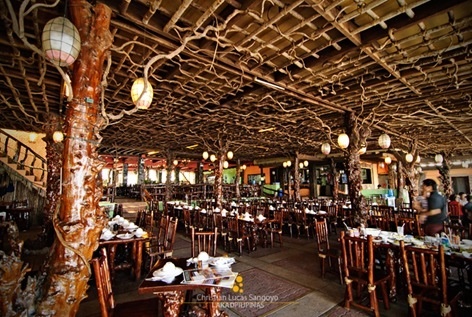 There are more to see in Tagaytay other than the Picnic Grove, Taal Lake view, bulalo or coffee! See you again soon, Tagaytay!